Antique/Vintage - Crown Staffordshire Fine Bone China - "Pear Blossom" - #F16218 Pattern - Made in the 1930 thru 1956 period - Totaling (53) Pieces. A lovely "Pear Blossom" Patterned, Fine Bone China Tea Set, by Crown Staffordshire, is both Elegant and Casual at the same time. The White Flowers with Yellow Center, and Green Leaves, are stunning. All Pieces are rimmed in 22kt Gold, with 22kt Gold feet and/or handles on Cups , Platters, Sugar and Creamer. 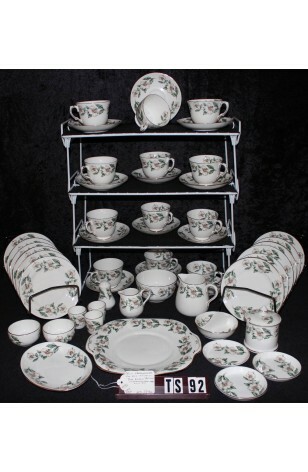 This set has a Service for (12) Twelve, with numerous Accent Pieces as well. 12 - Bread, Dessert, Tea Plates - 6 1/4"